Renaissance Park is a 23 acre wetlands park designed to highlight this area's ecology and history. 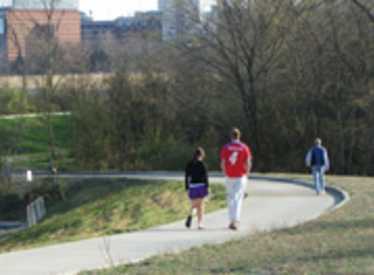 Once the site of manufacturing plants, Renaissance Park demonstrates how a polluted area can be returned to a clean river habitat and a natural park setting. The park's design promotes the return of native plants and animals, enhances river eco-systems, and provides a balance between urban renewal and the conservation of natural resources. Renaissance Park also celebrates Chattanooga's rich heritage. Located throughout the park are features that remind visitors of past events and cultures that are distinctive to this area. Entrances and parking are located on Manufacturers Road by Hill Overlooks and the Outdoor Pavilion.